To see 2015's August Eve altar, click here! A cross-quarter holiday, August Eve, also known as Lammas or Lughnasadh depending on your beliefs and practices, is the first of three yearly harvest festivals. Falling between Midsummer and the Autumn Equinox, it is an equilibrium of fall and summer, representing a hot, green day with tumultuous storms, yet the cutting of the sheaf and the preparation for the darkness ahead. That being said, unless you're a farmer or enjoy gardening, it's not likely that you'll be harvesting any food during this time of the year. Instead, we focus on the symbolism of the harvest as a ritual for creating cycles and focus in our lives. During this sabbat, we reflect on goals achieved from seeds sewn in the spring, the letting go of what is not needed for the months ahead and strength and fortitude for the work to come. 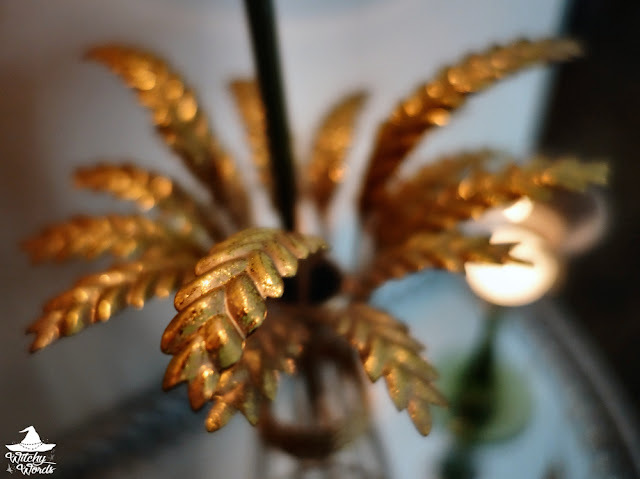 When it comes to August Eve, I think of greens and golds. Despite thinking of harvest as a time of falling leaves and cooler days, August Eve is right at the height of the Midwestern heat. The trees are still full of bright green leaves and the sun is beating down on you if you dare to venture outside. Gold, in this case, is symbolic of both the hot sun and the wheat we harvest, invoking prosperity and richness. Green then represents the green leaves of the trees as well as fertility, earth and abundance. I used these colors at the back of the altar where I placed three candles, a tribute to the three harvest holidays of the year. I also utilized hints of black in the altar to invoke the darkness to come. In these gorgeous wheat candle holders, I placed black sand to hold up the thin green candles. 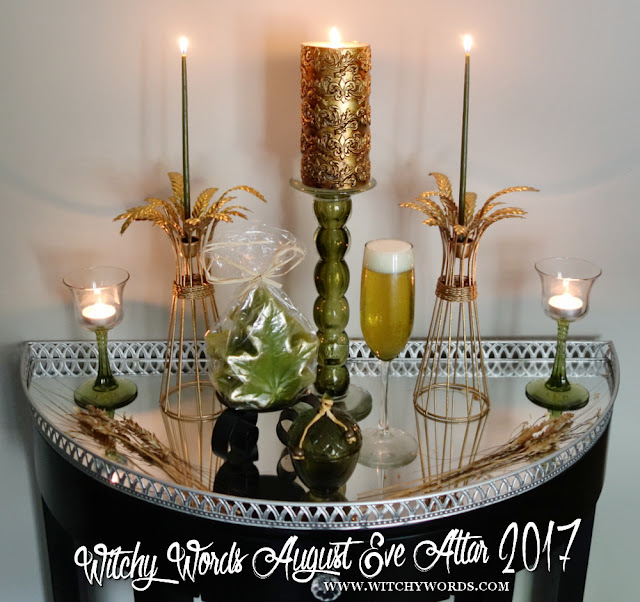 I also used a black pillar candle holder to hold a green and gold leaf candle, again something representative of the life and sun preceding the darkness ahead. 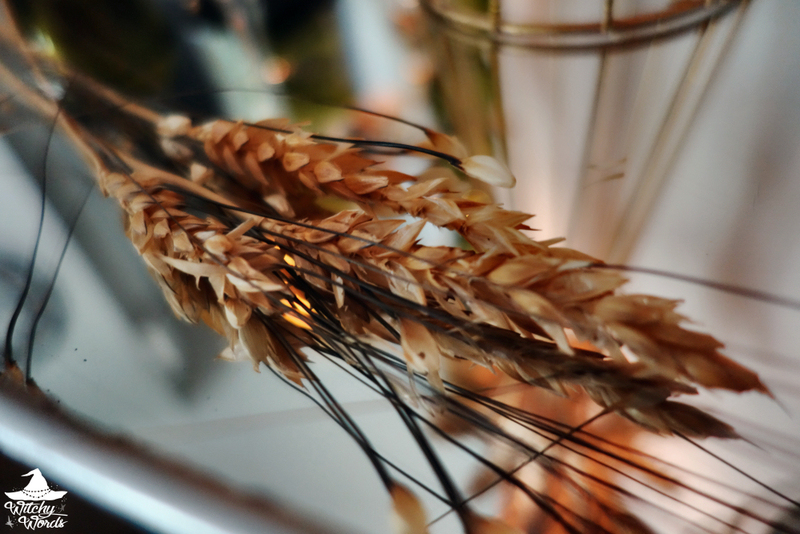 Symbols of wheat lie about the entire altar, from actual grain to shapes of wheat to a cup holding ale, which is, of course, fermented wheat. Grains are the common harvest for this time of the season and wheat is the most common, so it's the symbol I've chosen to focus on for this altar. 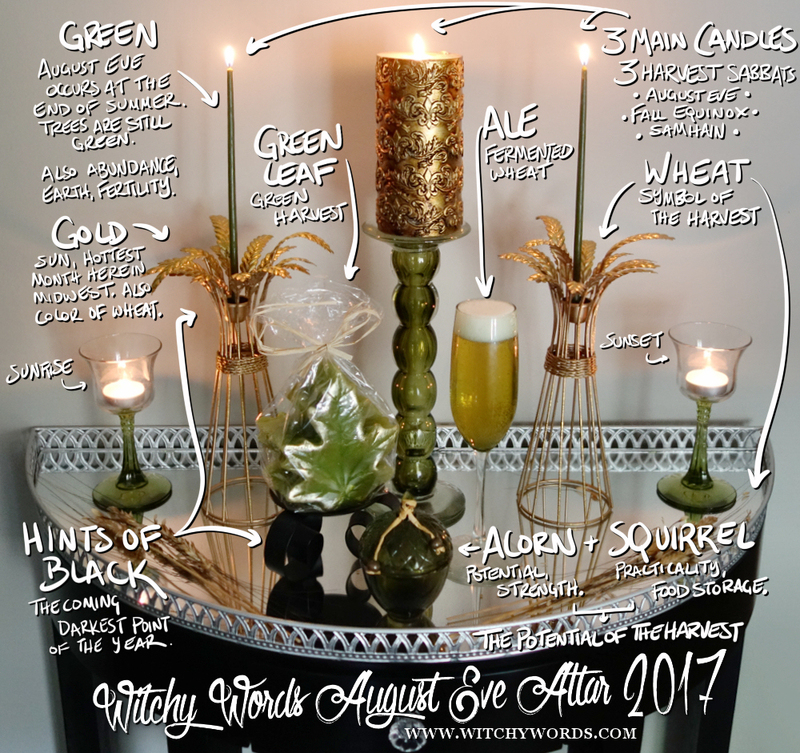 At the very front of the altar sits a green glass acorn. Acorns, seeds of oak trees, represent potential and strength. They also happen to be what the squirrel harvests and stores for the winter. 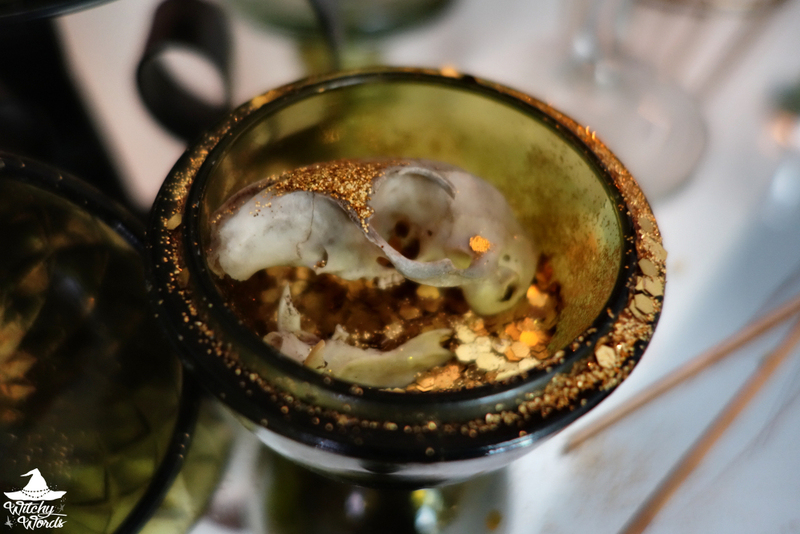 Inside this glass jar, I placed a squirrel's skull in a bed of gold glitter. We often think of squirrel's symbolism as playful and quick, but squirrels are also incredibly practical foragers who rely on their own means to survive the winter. By placing this skull in a bed of gold, representing prosperity, and closing it inside an acorn of potential, I've created a monument to the potential and strength of the harvest that is August Eve. Above the altar, I've placed large and thick barren wreath, representing the bare months to come. As we move forward into the next harvest, that wreath will get thinner, which will represent the culling back of our own bounty to reserve enough for the months ahead. While we can enjoy what we have now, we must be practical like the squirrel and store for later! Your sabbat altars are always so creative! They're some of my favorite posts to read. The lush green of summer and the pale gold of early autumn is perfect for August Eve. This altar is beautiful! Where did you get a squirrel skull? Thank you so much, Liz! A circlemate actually found it in her yard and I cleaned it myself.